PHUKET: -- A member of a gang of burglars who target high-end homes of foreigners living in the Cherng Talay area was arrested over the weekend and presented to the Phuket press today. 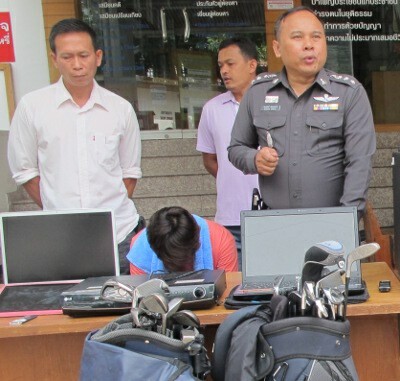 The suspect, 27-year-old Wittawat Maneesri, was presented to the press by Col Jirasak Siamsak along with over one million baht's worth of stolen electronics and other valuable seized from the suspect's home during his arrest on Saturday. Mr Wittawat, previously convicted on drug related charges, confessed to police that he worked with a team of three others to steal valuables from houses in Surin Spring Villa, Ayara Hilltops Boutique Resort & Spa, Baan Thai Surin Hill, Layan Estate and Suriyana Villas, as well as other resorts and villas in and around Cherng Talay Village 3. The gang had an intimate knowledge of the area, Col Jirasak said. 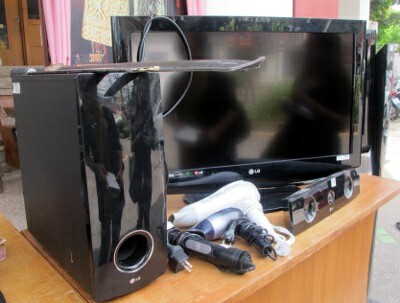 Police confirmed that the gang sold the stolen goods to various shops on the island. Based on CCTV footage, foreigners are suspected of involvement in the gang's activities. “We are now trying to track down the rest of the the gang. Hopefully we will be able to arrest them soon,” he said. He advised foreigners living in villas and long-stay resort accommodations in Cherng Talay to notify police prior to vacating their premises for extended periods. "We will send officers to patrol the area around your house while you are away, so you can be sure your house and belongings will be safe,” said Col Jirasak. Cherng Talay residents who think they might also have been victimized by Mr Wittawat should call the Cherng Talay Police (076-325630) to reclaim their property. Nothing to add... SOOOO GOOD! The quote of the day!